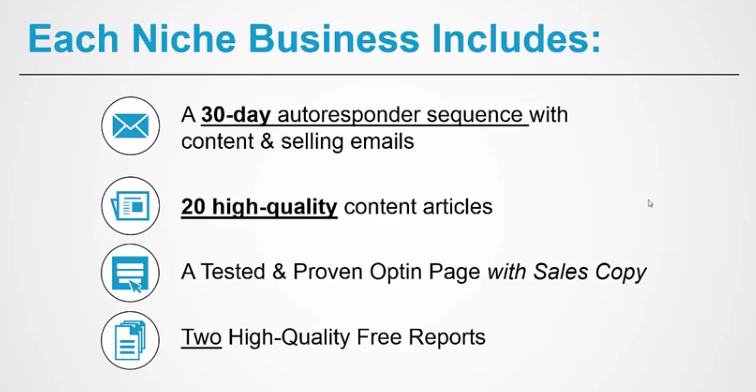 Niche Profit Full Control Review – Can ‘Niche Profit Full Control' Really Show You How to Build a Recurring, 7-Figure Digital Business That Runs Almost Entirely on Autopilot? Its easy to chase loopholes and short-term tactics to make money online, but loopholes eventually close and the money dries up. Niche Profit Full Control promises to show you a more sustainable business model, one that can pass the test of time while being low maintenance at the same time. So lets go ahead and jump right into the system to see what it contains and how it can benefit you. The first component of Niche Profit Full Control is the 8 weeks on in-depth training which gives you a step-by-step process to follow. 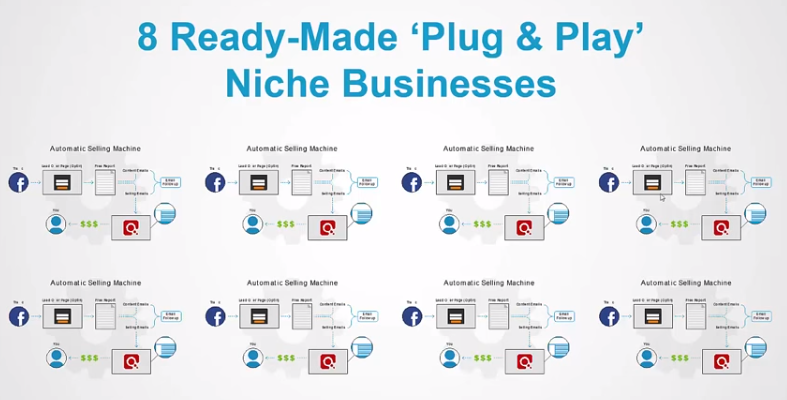 This is all about niche selection, so if you're a complete beginner and have no prior experience, this will help you dial down your profitable niche. If you have some experience, this training will help you gain valuable insights for your niche to help you sell more effectively. ASM refers to ‘automatic selling machines'. This setup refers to creating your first lead magnet, which is basically a free report, a simple Optin page and driving free traffic immediately with 3 different methods. Week 3, as shown in slide above, is all about creating digital products and marketing funnels that work on autopilot. The most valuable thing you'll learn is how to create ‘in demand' products that your market needs and wants, so its practically guaranteed to sell. Also, how to create products rapidly, without having to write or create anything yourself! Keep in mind that you can apply these same concepts to sell affiliate products, so you don't have to create your own product in the beginning. Alright so once you have your sales funnel down and Sales are coming in, now its time to optimize conversions and make sure you're making more money from the traffic you're getting. Basically, you'll be given Salesletter and Video Salesletter templates that make it much easier to create a high-converting piece. Details about tracking and split-testing are also covered in a really simple way, helping you enhance your results over time. 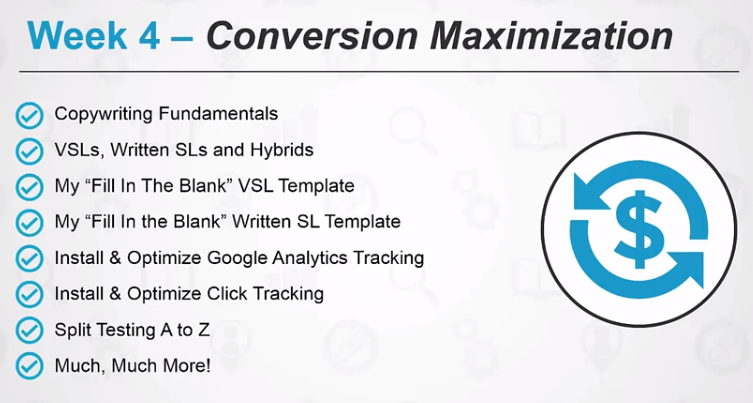 Everything's in place, conversions are optimized, and now its time to ramp up the traffic. This module is all about setting up paid advertising campaigns, specifically on Facebook and through retargeting. Setting up affiliate programs and striking JV deals are also covered. 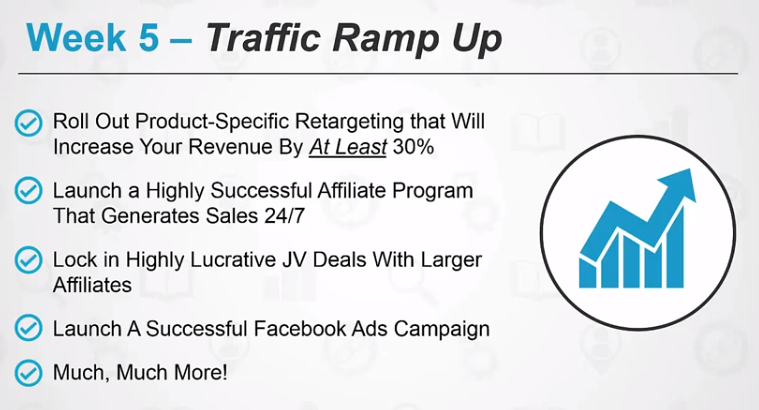 With this module, you'll know how to drive targeted, profitable traffic at will, which is the key to scaling and growing your income. Now we're getting into more advanced tactics for profiting from the ‘backend' of your business. Most of the money is made in the backend from your existing customers and subscribers, so this module will show you how to maximize the profits long-term. From product launches to evergreen email promotions, you'll learn how to promote offers to your list for years to come, as well as the secrets to using Webinars to drive high ticket sales. Paid traffic is great for helping you systematically scale your business, but organic traffic is free and can really build your brand and authority. 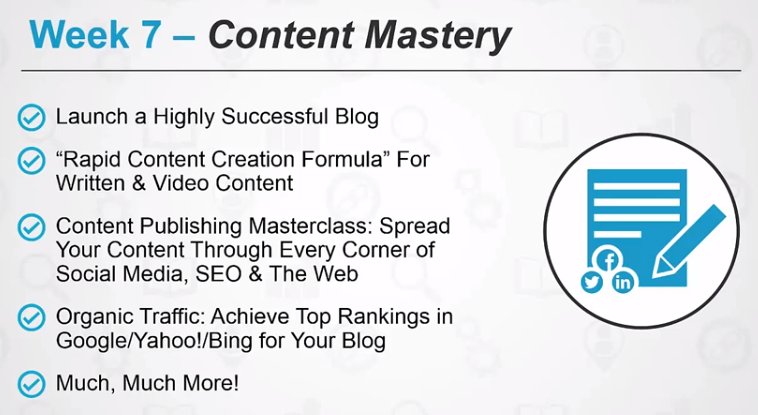 In this module, you'll learn how to leverage Social Media, SEO and other influencers in your niche to build your brand and authority through content marketing, which getting tons of free, sustainable traffic that doesn't cost anything. And finally, Module 8 is all about outsourcing, fulfillment and management, so you don't get stuck running your business all by yourself. This module will show you how to grow your empire through outsourcing and get all the tedious tasks handled by outsourcers, so you can spend more time on the things you're passionate about. 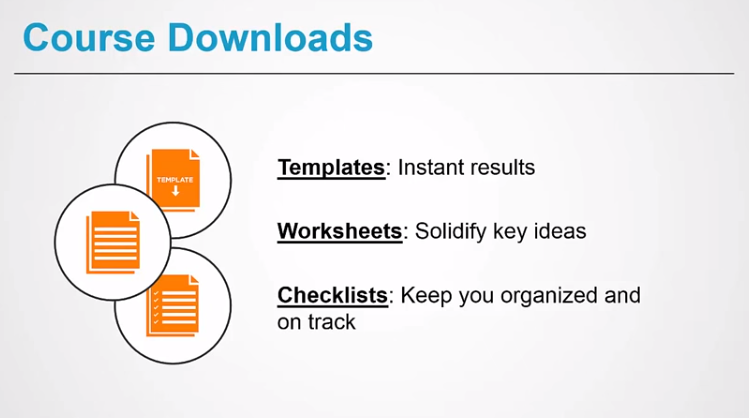 To help you stay on track with everything you've learned, you're given templates, worksheets and checklists to stay organized and on track. This will help you make sure you continuously progress day-by-day and never lose sight of the big picture. 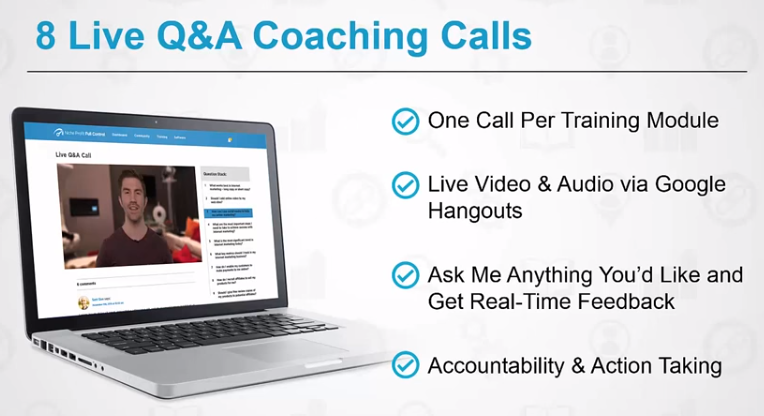 These live calls are designed to help you get your questions answered. You can interact with Adam directly and ask you most pressing questions. I really think this is one of the most valuable parts of this system. 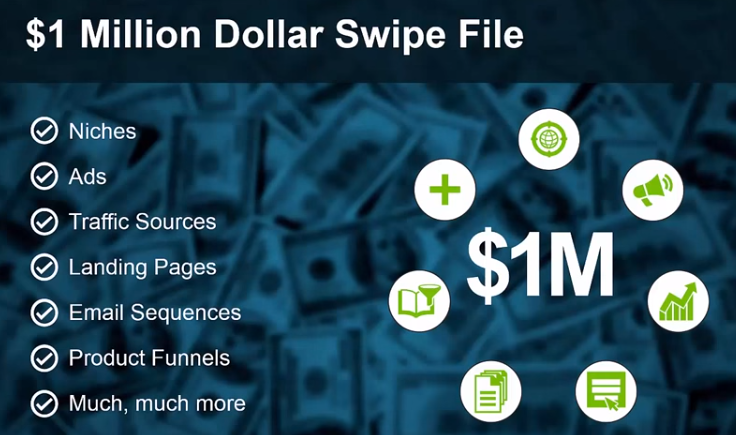 An entire swipe file of Adam's successful sites and campaigns that you can easily copy! From Ads to landing pages to email sequences and more, simply model your own funnel after one of these templates and set yourself up for early success. In addition to training and live Coaching and Q&A, you also get an entire suite of software tools to help you get better results. 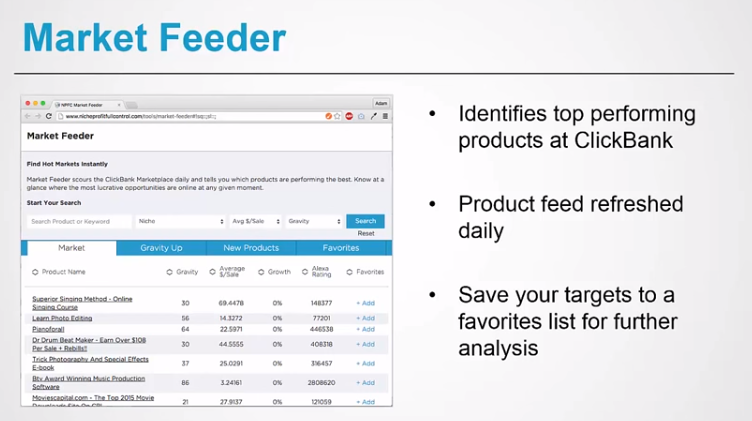 The Market Feeder, as shown in the slide above, will help you quickly find profitable products to promote that meet Adam's own criteria. 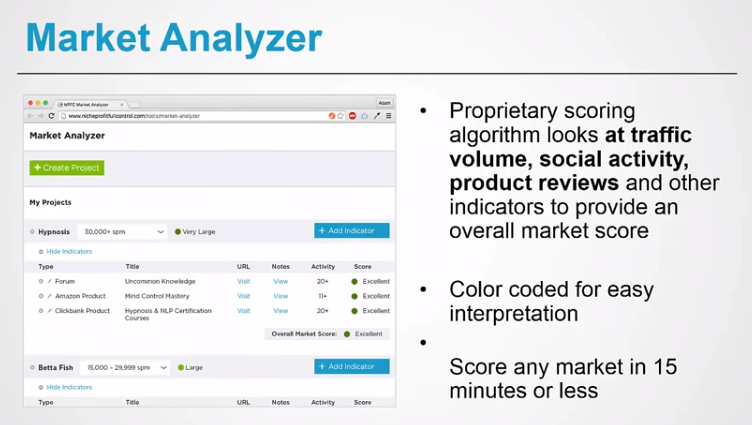 After you've chosen a product to promote in a certain niche, the Market Analyzer can help you make sure that there is great potential in the niche to make money, and how difficult or hard its going to be. If you're a complete beginner, this will help you choose easier markets to target. 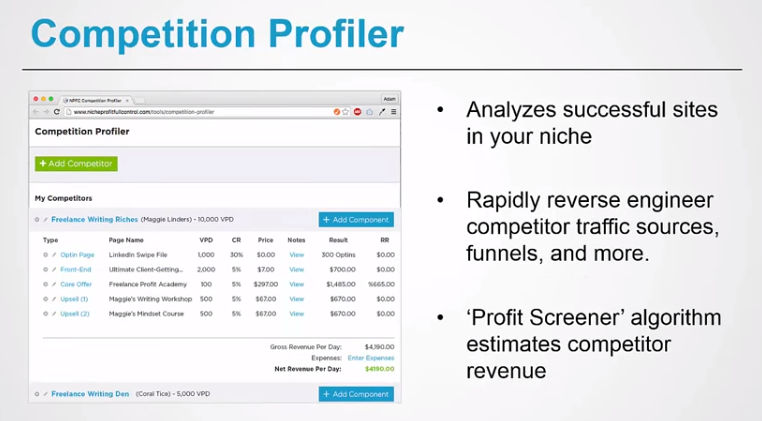 The Competition Profiler is useful in helping you spy on and take your competitors' best strategies. It also gives you their traffic sources and an estimate of how much revenue you're generating, so you can see who you're going up against and how to model after them. 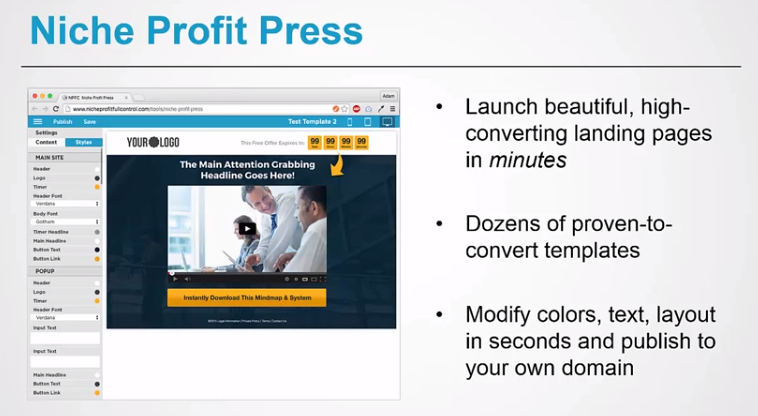 If creating landing pages scares you, then the Niche Profit Press will be a simple and easy tool to use. It comes with pre-designed, high-converting templates that you can customize in minutes. It also saves the expense of paying for a premium landing page builder. 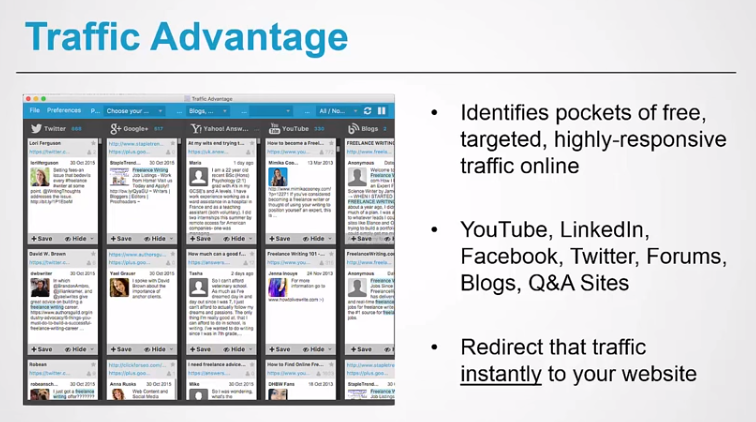 Traffic Advantage is a good way to start getting traffic immediately for free. It identifies various sites where ‘conversations' are taking place in your niche, so you can join the conversations and promote your site in a subtle way. 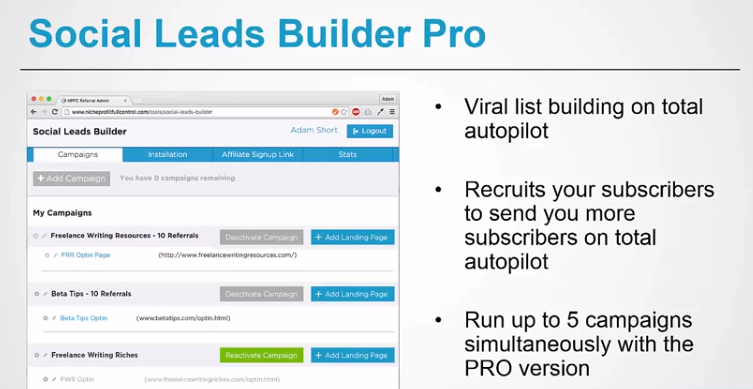 Social Leads Builder Pro lets you setup giveaway campaigns to increase the viral potential of your traffic. It encourages people to refer family and friends to your websites. 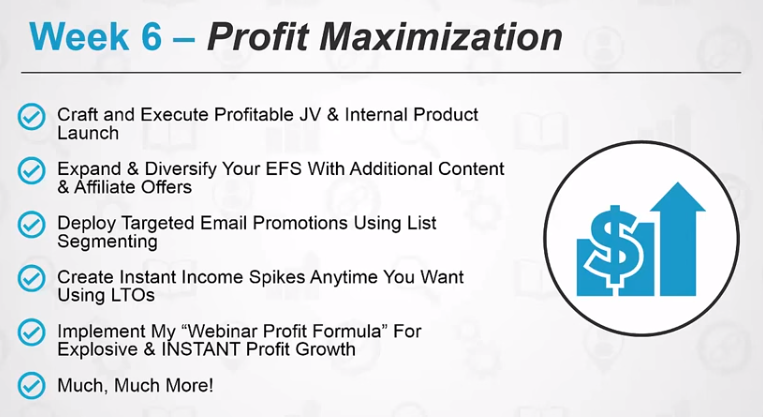 In addition to the Training modules, the live Q&A sessions and the software suite, there's also Community and Coaching that you can take advantage of with Niche Profit Full Control. 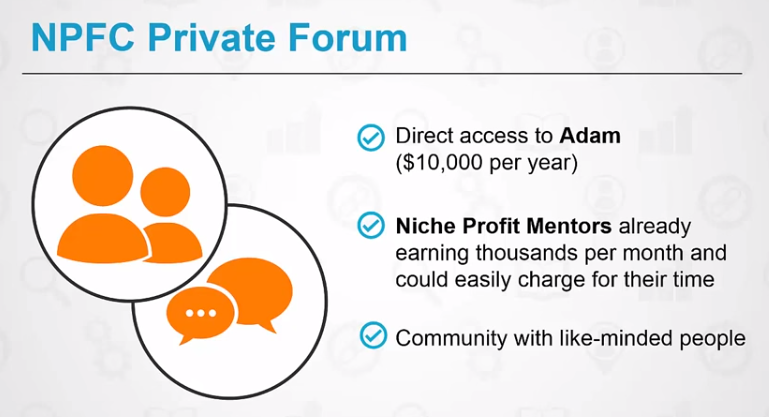 In the NPFC Private Forum, you can ask Adam questions and he'll drop in to respond, and there are other highly successful members who you can interact with directly. 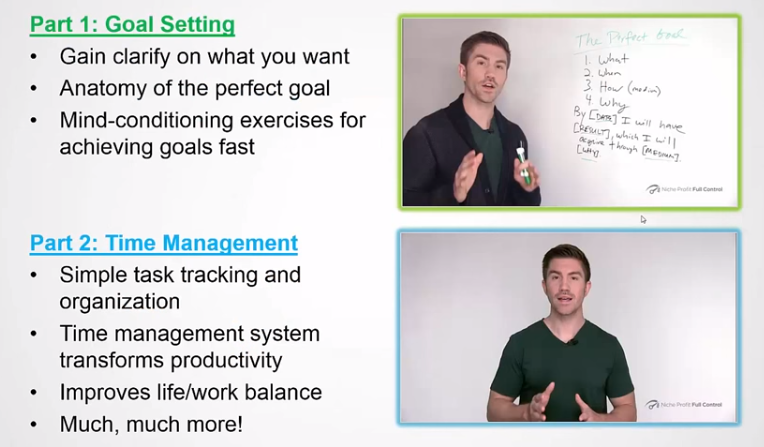 As a bonus, Adam is including his ‘Time Management and Goal-Setting' course that shows you how to productively everything done in your business, so you can progress at a faster rate and have more time to do the things you enjoy. So you won't have to design landing pages, create reports, write emails or any of that. 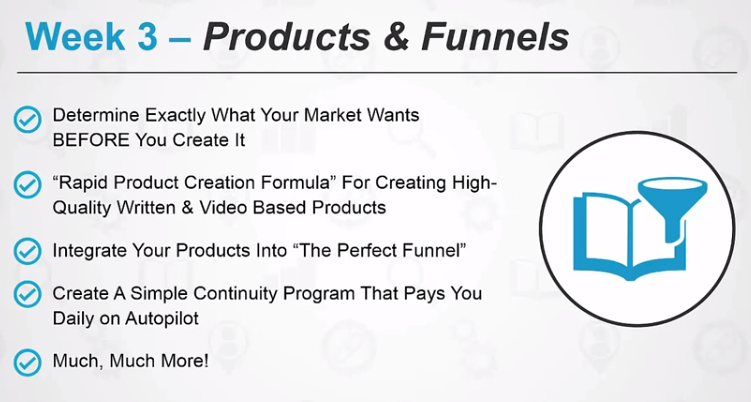 Simply use one of these existing funnels/campaigns as your own and drive traffic to them. A large part of this system revolves around creating your own digital product. 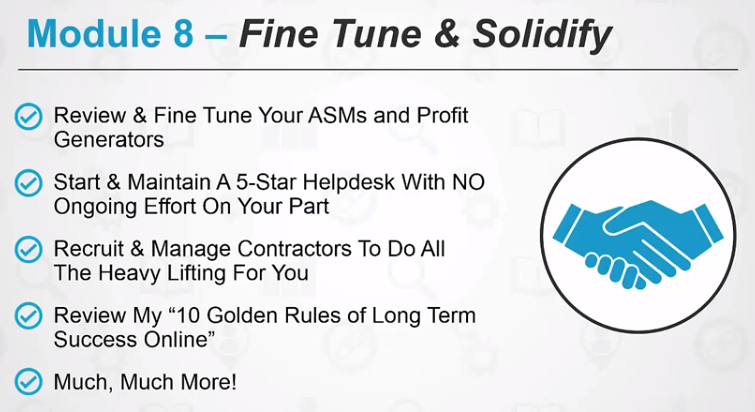 Now Adam will show you rapid ways to do this, but if you want to scale this system big, you'll need to create your own products. In the meanwhile, you can get started with affiliate promotions in the beginning. Also, the ‘done for you' niche businesses he's giving you are a good way to get started, but if you strictly rely on them and don't tweak/optimize them in the long run, then they won't be very effective for you. Lastly, this is a time consuming program that will require multiple weeks to successfully execute. Its not something you can learn and apply overnight…it will take a dedicated effort over a few weeks. As of 2015, almost 75% of U.S. mobile subscribers own a smart phone. That is nearly 182 million individuals! If you would like to be able to connect with this huge audience, then you need to be able to develop some iPhone marketing strategies that will allow you to directly target them whenever they land on your website and how the brand new Niche Profit Full Control training course is helping new marketers profit online. Many people believe it is easier to specifically design for the iPhone since iOS is used only on Apple products, which means you can offer a consistent experience for users across just a few kinds of devices. Since the Android operating system is used for several different mobile device manufacturers, your designs might not always look the same on the different types of devices. – Simplify your website navigation. Since the screen size is much smaller, you won't have enough room to display all of the pages and links that you usually would. Either nest some of your pages underneath others or simplify your options in order to make it easier for mobile users to navigate your site. – Use buttons instead of links. On mobile websites normal-sized text has a tendency to be very small, making it hard to press on text links without having to adjust the size of the content. For your call-to-actions, you should use big, tappable buttons whenever you can. They are more attention grabbing and easier to click on and Niche Profit Full Control members will be able to benefit from a ‘turnkey' solution. – A single, fluid column layout should be used. This layout works best since a majority of mobile devices offer both vertical and horizontal orientation. – Reduce file sizes and use fewer images. Each image that you use has to be downloaded by your mobile visitor. Your website will load more slowly if you have large or too many images. Now that the basics have been covered, the iPhone marketing strategies below will help you attract more visitors to your mobile site and convert more of them into customers. If you haven't done anything to make your business website mobile-friendly lately, then it is definitely time. It can be tough to keep up with new processor speeds, resolutions and screen sizes since new iPhones get released one or two times per year and Niche Profit Full Control users won't have to waste time doing niche research, since everything is handed to them. Don't get tripped up by all of the details. Just begin the process by reviewing your site from a mobile perspective. Instead of trying to squeeze all of your current site's content onto the iPhone screen, use this as an opportunity to re-examine your site's mobile experience. Think about what elements are the most important and which ones can be removed so that the experience for mobile users is more seamless. One example would be to reorganize the content on your website so that iPhone users are able to get into the heart of your website more quickly. In addition to removing images or website elements that make it more difficult for iPhone users, you will also want to consider adding certain website elements on order to customize it for mobile visitors. Instead of creating different versions of your site for mobile or desktop, consider using mobile responsive design instead. It can be hard to maintain two separate versions of your website, and it can be potentially detrimental to your brand if users have completely different experiences on the mobile site compared to the desktop website. In order to avoid have these potential problems, you should invest instead into a mobile responsive web design for your site that automatically changes the content or layout of your site based on the user's screen size and Niche Profit Full Control members should also keep this in mind as well. So another option is instead of designing two separate website versions and continuing to make changes as technology develops, you can instead create one website that offers the same experience to all users, no matter what screen size they have. It is much easier to update this type of strategy as the iPhone continues to evolve and change. It also helps you with organizing your content so that all of your visitors (both mobile and desktop) can find it easily. You can start out with an app-first strategy if you can't afford to overhaul your website at this time or aren't prepared to use a responsive design. Or you may want to supplement your responsive design with an app if it fits in wit your business. You also want to optimizing what you have already. After all, the ultimate goal of any kind of mobile site or app is to provide your business with results from the mobile traffic that you receive. There are always certain pain points that need to be addressed when it comes to your mobile site's functionality and content. For example, everyone knows that it is hard to fill out forms and type on an iPhone, so just begin with that idea and carry this through your entire conversion process. Use an iPhone to go through your entire site, and think about what intentions your visitors have and optimize your site wherever possible and Niche Profit Full Control users already get a mobile optimized site, so they don't need to worry about this issue too much. If visitors are coming to your mobile site in order to get your phone number, have a “click to call” button prominently displayed on your website so that they won't need to type it in or copy and paste it. Also use pre-populated forms and drop-down menus whenever possible so that users don't have to manually type so much. Although is may seem challenging trying to decide how to optimize your website the best for iPhone users, it provides your business with a great opportunity to capitalize on the mobile trend so that you can connect with more customers. There are many different options that are available for your business, so do some research first and then decide on what the best strategy is for your business to use based on your goals and needs. When people started downloading applications from Google Play years ago, they often found themselves very limited. Most of the applications that were developed were designed for iPhones, and not Android phones. Today, it appears that tables have been turned against Apple as twice as many applications have been downloaded from Google Play than from the Apple App Store. At 50 billion to 25 billion, this is a significant change that has Apple reeling, wondering what to do in order to compensate for their loss. However, this could be nothing more than more people using Android phones and not the popularity of the applications themselves and how the Niche Profit Full Control training course is changing the way marketers perform niche research. According to the recent reports, specifically Evans of Silicon Valley, Google has actually been paying developers more money this year than in the recent past, going up from 5 to 7 billion. Apple had remained the same. This increase in the amount of money that is paid out is reflective of the downloads and what is available, clearly showing some indication as to why Google Play is now ahead of the game. It is possible they may actually overtake the Apple App Store, which would have been unheard of years ago. It simply looks as if Play is growing at a much faster pace than ever before, and due to the availability of apps that were not there just a year ago, it stands to become top in this industry. Part of the reason that there are more downloads is the fact that android has the user base that is nearly double iOS users. This could be because the phones that are purchased with the Android system are typically far less, and sometimes much more innovative, motivating people to invest in things outside of Apple. So what does this mean for Apple and where would they go in order to compete? The answer is very simple and Niche Profit Full Control members will be able to gain an advantage by working in a profitable niche. The main complaint that many Apple users have had with Apple phones is that they are behind the times. If you look at the innovations that have occurred with products like the Samsung Galaxy, it is clear that Apple needs to play a little bit of catch-up. However, it seems that Apple is not that concerned with equally, much less overtaking, the competition because they have a secure user base that will continually use Apple phones, even if their upgrades are not that fantastic. They are not in a competition, so to speak, because of the many loyal Apple users that simply will not use any other type of smart phone. The same is true with the iPad. It is the leader in that industry, superior to all other similar products. It is the loyalty of their consumers that purchase regularly, not so much the updates or upgrades, that keeps Apple at a steady pace of continually growing, not worried at all about the number of applications that are downloaded each year. If they wanted to have more users of their Apple products, they would step up their game to become just as good as the competition. Until that time, they will continue to grow gradually, but they will in no way ever compete with the incredible numbers that Google Play has come up with as of late and Niche Profit Full Control users should also keep this in mind as well. Although these numbers seem to show that Apple needs to do something dramatic in order to compete with or overtake the competition, Apple makes most of its money by offering new products every year that their loyal followers will continue to upgrade to. Even though the upgrades are not as fantastic as you will find with some of the Samsung products that are created today, it is the notoriety and brand name of Apple that keeps people coming back, wanting to never use anything else. It seems that Apple really doesn't have to do anything despite Google consistently gaining in many different areas. They will always be an elitist club of users that absolutely love Apple products, and will continue to contribute to the success of this company, regardless of how many applications are made for Google phones or downloaded on a regular basis.